Jim Dodson Law was honored to participate in Tarpon Spring Fundamental School’s bike rodeo on Friday, Jan. 24, 2014. All Children’s Hospital’s Safe Routes to School (SRTS) director, Tiffany Sabiel, and Kati from our office partnered to teach the entire third grade class of Tarpon Springs Fundamental about bike safety skills. Students were excited to find free helmets and bicycle lights from our Helmets for Kids Program upon arriving at the rodeo. 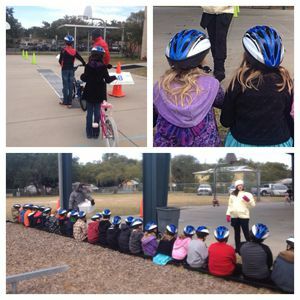 Each student was properly fitted with a complimentary helmet and taught how to use stop and turn signals on a bicycle. Students also learned how to safely cross the street and properly enter and exit a driveway while biking. “Bicycling teaches children responsibility while providing them with a sense of independence. I hope the students will use the skills they learned at the bike rodeo today along with the helmets and bike lights to protect themselves while riding,” said Attorney Dodson. Jim, an advocate for safety and a cyclist himself, wrote the Florida Bicycle Accident Handbook to help fellow cyclists ride safely and also to know steps to take to be legally protected if the worst happens and they do become involved in an accident. Complimentary copies are available on our website.